As a little girl playing up in a tree in her backyard, Nancy pretended she was riding an elephant in Africa while most girls were playing with dolls. Since she can remember, Nancy dreamed of one day going to Africa. She was intensely curious about the land, the tribes, the animals and the culture. 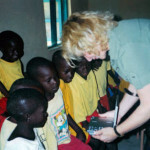 In 1987, she experienced Africa for the first time and her reverence for it only deepened. Nancy would return again and again to quench her thirst. On one of her trips, while looking for children to paint, Nancy discovered a small hut with 60 children in an impoverished fishing community. 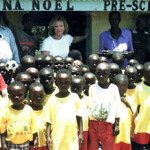 Nancy was amazed at these children who had lost everything – parents, friends – to AIDS, accidents and illnesses. And many had AIDS themselves. They had been facing death from the moment they were born. Nancy observed, “As has always been my experience in Africa, the children were full of enthusiasm despite their circumstances. No matter how much they lacked, they were still vibrant with laughter and kindness.” After Nancy left the children that day, she promised to take care of them. 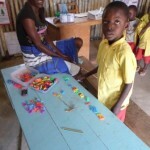 Thirteen years later, Nancy’s preschool has 250 children and continues to grow. 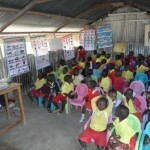 A new building was completed in 2011, and the children now have several teachers, access to supplies, a feeding program and a doctor on staff. The kids appropriately call Nancy “Mum” as she has mothered them all with her unwavering commitment. Above is a 2 minute video of the students singing a song of gratitude to Nancy. N.A. 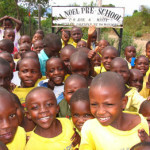 Noël Preschool is dedicated to providing quality education and care for the children of Rusinga Island in Kenya, Africa through financial support of the school, tuition, uniforms, books, meals, clean water as well as medical treatment. Since 1999, the N.A. 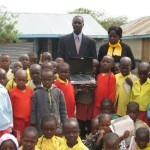 Noël Preschool has uplifted the entire community. 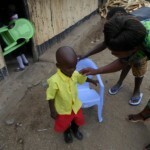 Many of the children have been orphaned by the AIDS pandemic and are also infected with HIV/AIDS. The school is a place of safety where the children gather each day in hope, laughter and great joy so they can flourish. We are very excited to have the new building construction completed. 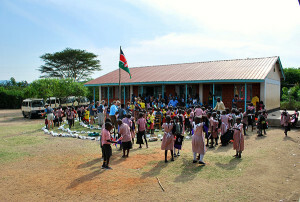 With growing enrollment this new school building allows more children to continue to be served. 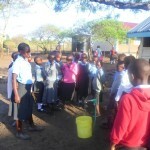 opportunities to these special children.